Hello loves! A very popular color for weddings this year is dusty blue, and the number one question I receive after that from brides is wondering which metallic it should be paired with, specifically with silver and/or gold. Although I believe a lot of that has to do with your personal preferences, I think there are some pretty substantial differences in the way the two metallics look with it, so today there are two inspiration boards for you to compare and choose your favorite! 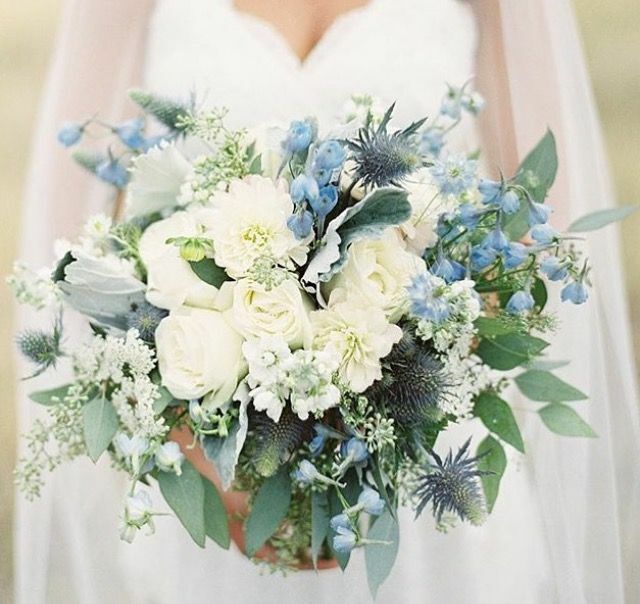 Both of these below are incorporating a dusty blue hue primarily throughout the wedding, with various shades and hues of blues brought in as well. However, adding either the silver or the gold changes the entire look dramatically, which I believe you will think too! I first designed an inspirational board incorporating silver into the palette, and then designed a color palette with dusty blue and gold, with a bit of a bolder blue to bring out the gold a little bit more as well. By adding blues in various tones and shades to your wedding, it creates a bit more dimension to everything else as well! If you are incorporating dusty blue into your wedding, I love this Elegant Monogram Suite, which is a part of the Curated Collection. I can adjust this particular design in both color and style, changing out the fonts to one that will perfectly blend with your wedding. If you are incorporating gold, I think the lettering would look incredible completed in gold foil, don't you?! If you are incorporating dusty blue into your wedding, are you thinking of adding gold or silver? If so, which one has you swooning to be a part of your wedding day? I would love to hear from you in the comments below! Newer PostA Note of Grace: A Little Less Hustle, a Lot More Grace.